Precision agriculture is another example for application of advanced technology that measures and responds all information related to soil, farm and crop in order achieve higher productivity and quality output. The changing nature of agricultural land and the environment is the major challenge faced by the agricultural industry has led to growth in the penetration of technology. New technological opportunities in agriculture are in its way such as artificial intelligence (AI) and machine learning. Precision agriculture can be done for specific purpose or general purpose. Such as reduction of lime application in Australia was targeted, which in 2017 was dropped by 33% as surveyed over 75,000 hectares land in Southern NSW and Victoria. Global companies such as Agrian Inc. are expanding to Australia to tap the huge opportunities available by introducing advanced and innovative technology. This signifies the growing agriculture industry of Australia in terms of not only crop protection, production and productivity but also the growth of food and beverages industry. The farmers are now loaded with crop and related data, of which some information is not even used by them. Goldstein Research analyst forecast that the Australia precision agriculture market is set to reach USD 0.8 billion, growing at a CAGR of 15.1% over the forecast period (2017-2025). On the basis of technology, variable rate technology accounted for largest market share of 43.7% in 2017 and is expected to grow at a CAGR of 15.3% over the forecast period. The report covers the present ground scenario and the future growth prospects of the precision agriculture market for 2017-2025 along with the market players’ analysis. We calculated the market size and revenue share on the basis of revenue generated from major players in the Australia region. Australia Precision Agriculture Market Outlook 2017-2025, has been prepared based on an in-depth market analysis from farm market experts. The report covers the competitive landscape and current position of major players in the Australia precision agriculture market space. The report also includes porter’s five force model, SWOT analysis, company profiling, business strategies of market players and their business models. “Australia Precision Agriculture Market Report” also recognizes value chain analysis to understand the cost differentiation, pricing models to provide competitive advantage to the existing and new entry players. 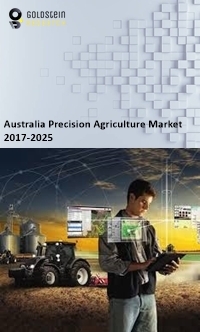 Our Australia precision agriculture market report comprises of the following companies as the key players: Agrian Inc., Precision Ag, McIntosh & Son, Convergio, GeoMoby, Precision Agronomics Australia, scientific aerospace, Topcon Positioning Systems, Inc., Raven Industries, Precision Planting, Inc., etc.